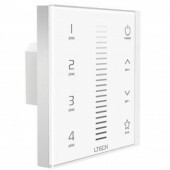 Wall Mounted Touch Panel Dimmers These dimmers fit in place of a standard UK light switch, so there is nothing to mislay and there are no batteries to replace. 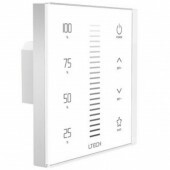 'Wired' controllers require a low voltage feed in and out. 'DMX' controllers require a mains feed in (live and neutral) and 3 core DMX wire out. 'Wireless' controllers require mains feed (live and neutral) only. 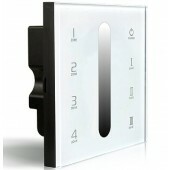 They are finished with a tempered glass touch screen and are very simple to use. Available single or multi zone with wired or wireless connection.